University of Wisconsin-Milwaukee’s University Housing department was looking for a unique move-in gift for the incoming residents. They wanted to provide an item that would be useful residents and enjoyable. Through brainstorming with the client, a mobile phone holder in the shape of a chair was chosen. 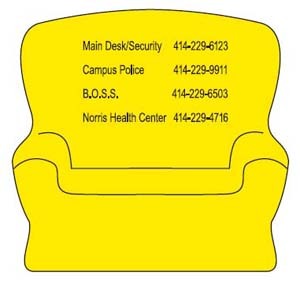 The chair was bright yellow (school color) and the imprint included important phone numbers. This product was a hit because resident’s no longer had land lines available in each room, making cell phones even more popular. The cell phone holder was informative to the resident’s with the listing of the phone numbers yet it was fun, unique and served a purpose. Even though these were last run in 2008, the cell phone chairs are said to still be seen around campus today.